The Detroit Historical Museum is hosting Salvaging Sound, an exhibition highlighting the work of the Detroit Sound Conservancy, now through April 7. Detroit Sound Conservancy is a nonprofit that was formed in 2012 with the goal of salvaging Detroit’s sound. They look for music-related artifacts in historical sites that are at risk of demolition, recordings that have been forgotten in basements, and yet-to-be discovered area musicians. 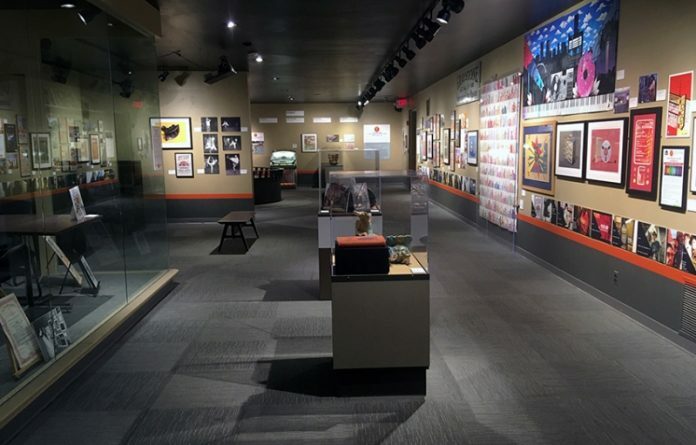 The exhibition is located in the museum’s Community Gallery and includes artifacts, narratives, photographs, ephemera, oral history recordings, and music. Area artifacts on display include a refurbished jukebox salvaged from Jordan’s Barber and Beauty, the salvaged and renovated Blue Bird Inn Stage, and elements from the Club Heaven Sound System. The exhibition also follows projects taken on by the conservancy since 2012, including artifacts salvaged from the former Graystone International Jazz Museum and Hall of Fame in Detroit, materials that pay homage to the struggle to protect United Sound Systems Recording Studios from demolition, and the plan to create a Detroit Sound Hall of Fame. Finally, a pop-up Preservation Factory and the conservation’s plan to purchase and reimagine the Blue Bird Inn at 5021 Tireman St. are also on display. Admission to the museum and exhibition is free. An opening celebration featuring musical guests Rev. Robert B. Jones Sr. and Melvin Davis, Detroit’s soul ambassador, will be held from 6-9 p.m. on Friday, Feb. 8. The celebration also is free of charge. The Robert and Mary Ann Bury Community Gallery is a changing exhibition space made available to local historical societies, museums, nonprofit organizations, and educational institutions, selected for their contributions to the metro-Detroit community. The Detroit Historical Museum is located at 5401 Woodward Ave. in the Midtown neighborhood. It is open 9:30 a.m.- 4 p.m. Tuesday-Friday and 10 a.m.-5 p.m. Saturday and Sunday.